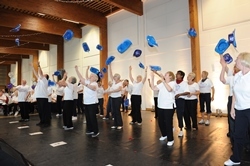 Following news that funding from Lincolnshire County Council for the Vitality project has been withdrawn, due to widespread cuts to their Healthy Lifestyle projects, the future of the project was unknown. However, we are pleased to say that, working with our partners Leisure in the Community, Vitality will be continuing with its programme of community classes. The One to One ‘at home’ service will stop as will the Health Support Programme, but we are delighted to be carrying on with our weekly classes for the hundreds of over sixties (and younger) that come to the classes and benefit so much. Please check the class list for any changes.